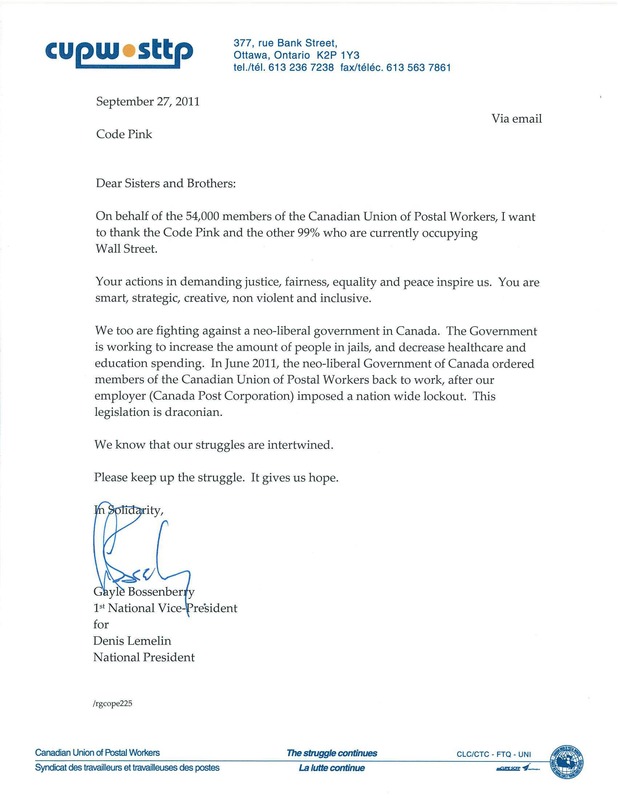 Canadian Union of Postal Workers thanks CODEPINK and the 99% for Occupying Wall Street! "Your actions in demanding justice, fairness, equality and peace inspire us. You are smart, strategic, creative, non violent and inclusive." Every day we Occupy Wall Street I am fueled and inspired by gestures of solidarity from around the world. Last week members of CODEPINK LA sent pizza to the demonstration; on Monday morning, two CODEPINK supporters visiting from Canada stopped by Liberty Plaza on their way to the airport and were inspired to make a donation; yesterday I received news that a "care package" is on its way to Liberty Plaza from our PINK sisters in San Francisco Bay Area. Every contribution and every message of solidarity strengthens the 99%.